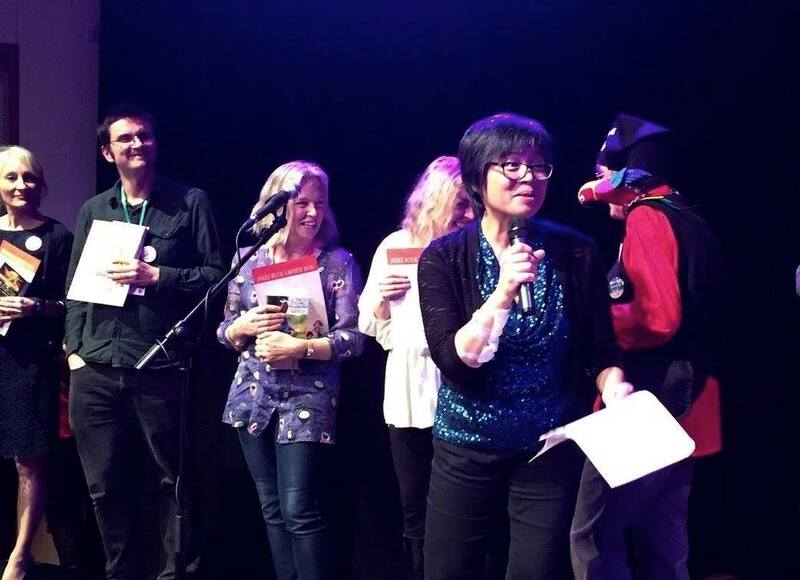 Every year I help organise the highlight of my writing year: the SCBWI Conference for children's writers and illustrators in Winchester. The irony of course is that I don't actually attend the conference. By being one of the organisers, my experience of the conference is that of sorting out the website, hustling behind the scenes, contributing to the programming, supporting the rest of the team, preparing panels, meeting and greeting on the day. But I get a huge kick out of watching something that was just a bunch of ideas turn into a successful reality. Here I am emceeing the book launch. Thanks to Teri Terry for the photo. In the background celebrating their new books from left to right: Helen Moss, Tim Collins, Helen Peters, Ruth Fitzgerald, Janet Foxley and parrot. This year, the title of the conference was: 'New Readers Ahoy! Creating Stories to Treasure' -- but I have to say, whatever name we give the conference, year after year, embedded under whatever we choose for the conference theme, is our true objective: How To Be Discovered. We are all hoping to be discovered. The unpublished are hoping to find the inspiration and information that would lead to their first book deal. 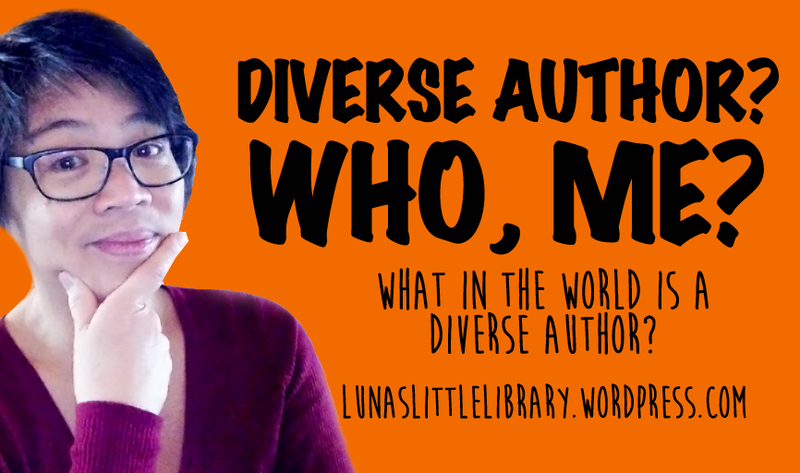 Even people who have been discovered, already been published, are continuously on the lookout for ways to stand out from all the other books out there. They want to be discovered by new publishers, by people who invite authors to festivals, by journalists, by teachers who might invite them to visit schools. Self-published folk are looking for the same thing but must struggle against bias and access to distribution. What's the good of creating stories to treasure if nobody can find our work? Over and over again, we are told: it's no longer enough to just write well (or 'Dance good' as publisher keynote David Fickling put it). We people who make the stories have to help get it out there too. But how? 1. Know the game. Attending a conference will bring home to you the enormity of the journey ahead of you. You will realise that you've got to raise your game. You will meet vast numbers of aspiring authors, just as talented as you, who are also waiting to be discovered. Should you quit or carry on? 2. Discover each other. If you decide not to quit, seize the opportunity to enjoy the company of these like-minded people. No, don't just socialise. Discover each other. The friends I have made at every conference are the ones who have held me up when I've been low and cheered me on whenever I've had a success. You're not just trying to get/stay published. You are opting into a community. Live it. 3. Meet gatekeepers face to face. There are many ways to draw attention to yourself on social media. You can participate in hashtags, tag famous people into interacting with you, retweet, link etc. Unfortunately there are a gazillion other people doing the same thing. So there's nothing like meeting someone face to face. Finding opportunities to meet people in real time teaches you how to conduct yourself in a professional way. You also very quickly discover that agents, publishers and editors are human beings. Seeing people as human is always a good strategy. 4. You've probably already got a platform. How do I build a platform? That's what everyone is asking - whether published, unpublished, self-published. You've probably already got one. Take a sheet of paper and make a list. You have a platform in your immediate family and friends. These are guaranteed sales. You probably have other platforms you haven't thought about before. Professional circles, perhaps. Friends around a special interest. The question is: how do you get these friends and acquaintances to not only buy your book but to persuade others to do so? 5. Know your influencers. Should I build a platform from scratch? Don't. You have better things to do with your time -- like, for example, write another book. Rather than knocking on the doors of strangers (this is what it feels like for non-bloggers who are forced to start a blog so that they can 'build a platform'), it is better to focus on influencers -- in children's books, these are librarians, teachers, booksellers. Can you get influencers to love your book? Can you get them to persuade others to read it? 6.You're not a salesman, you're an author. Promoting your book must be a lot more subtle than shouting 'BUY MY BOOK!' on social media. You're an author. You're shinier than a salesman. What a turn off if Meryl Streep turned up at your door saying, 'Watch my movie!' Don't be that kind of self-promoter. You are about STORY so craft your story ... the story you are going to tell in radio interviews, newspaper articles, festivals, school events. Read my piece Being Human is the Best Kind of Marketing. 7. Engage with communities. Communities are groups driven by shared interests. If your book has a theme or focus that drives a community, this can be a chance to engage in with interested people in a meaningful way. The quality of your participation may lead them to your book. Book promoter Tim Grahl advises authors to be "relentlessly helpful". People respond when they are rewarded with things they want. So. What do people in your communities want? 8. Make a plan. Quoting Grahl again: "Successful (book) launches are not random events. Authors don’t throw together a few Facebook updates and blog posts the night before, then watch their rankings skyrocket the next day." Think things through. Don't just set up a blog tour without understanding how these things work because your publisher told you to. Ask yourself, why am I doing this? What is my pay off? Can I measure it? How sustainable is this plan? Authors are notorious procrastinators ... if anything, a plan will help you keep things in proportion and remember what your real job is. 8. Be findable. It still surprises me to discover authors who haven't set up websites or at least got a presence on social media. Yes, the internet and social media can be all pervasive and time-sucking. But we are LUCKY to live in a world where we have the power to put ourselves into the public eye without depending on the vagaries of fame. Are you findable? Maintaining your own presence on the web means you control your story. If you don't have a website or run your own social media accounts, you are in danger of handing your story to others to tell. And you will have no control over what they say. 9. Be useful. The truth is people are just interested in themselves and in their own needs. They're not particularly interested in you (unless you are famous, and then they want to know everything about you - but that's for their own entertainment not so you can sell more books). People only find you if they need something from you. If you're a children's author, you will have child readers trawling your website if you can help them with their homework. Teachers will be looking for teaching resources. Librarians might be looking for reading lists. If people find you, will they get what they're looking for? Be useful. 10. Be amazing. Ultimately of course, you've got to make something amazing to be discovered. Something people really really want. Nobody was ever discovered that did nothing. So make sure you do that. Write the best book you can. Be the best author you can be. Be amazing. Candy's books are Shine and Tall Story. It's Christmas soon. Hint. Hint. Here're ways to be discovered which make the most out of 'you'. Great advice, Candy! Ezcellent post. I was thinking about being amazing at one of the conference sessions. The session with Penny Holroyde and Julia Churchill. The room was packed and they probably only take on one or two authors a year. So someone in that room of maybe 50 people was going to have to write something amazing to grab their attention. It does make you try harder. Or give up. Those odds were clearly not in your favour! The odd thing is :) - lots of us don't give up even though we know the odds. We may back off from time to time but we keep coming back to I because the drive to write that amazing book is really powerful. I don't feel that I'm in competition with other authors, I'm competing with myself. And I'm going to win. Blimey, that was a bit of a statement! I'll have to do it now! You are, Maureen. Because you're a great writer. And didn't you just win something? The problem with this business at every level is: it's a waiting game. That's why I always tell people choosing to write is not just about an end goal of publishing a book, it's about opting into a way of life. Even if you haven't been found yet, you must live it. You've really got to the heart of things. Brilliant advice as always, Candy! But it's also such a subjective business - getting out there and being visible (as you suggest) is the best way to connect with those special people who will become your champions of findability. We need champions! That's key! If Meryl Streep were to go door to door she would be half dead and neglecting the thing she's amazing at. The noise around her comes from an accumulation of champions, fans, critics, film buffs, etc. The real task is how to gather champions around you. Simply said but not easy. Thanks, Candy. Great thoughts here. Self-publishing does have its problems, but it does make you have to 'be out there'. It's not really an option for indies. And yes, we certainly do need champions more than ever. Indy authors need a higher order of self belief, courage and persistence. Candy thanks for this...can we make #relentlesslyhelpful your hashtag? It does have a lot of characters. But you've been living that since I first met you on as part of the SCBWI community. I love that this post has a fistful of vital reminders in one place. AND TWO GREAT GIFT-BOOK IDEAS! Ha ha one gives one's self permission for a bit of shamelessness during the Christmas season. You are AMAZING. You are. Dance good and be amazing. That should do it... Thanks, Candy. Packed full of good advice. Thanks for another helpful article. If only there was an algorithm to match writers to their perfect readers. Sometimes it feels like we're all wandering round a foggy field forever missing each other. The algorithm is called a librarian. But I know what you mean. Actually in this business, it'seasy to lose your way into a publicity wormhole that ends up a dud (all those non paying festivals assuring you it will be good publicity for your book). The best gauge of truly "good" publicity is if it leads to an echo ... speaking to a roomful of librarians who might recommend your book is far more effective than speaking to a roomful of strangers with no particular interest in passing on the message. Wonderful insight! Joe, I think you should try to archive this on your blog through screenshots or copy and paste. Ephemeral media like Facebook and Twitter are only good for the moment. If you post it on your blog it will continue to be found for as long sas it is there. The value of the experience is then multiplied a hundredfold. Thanks for this excellent summary, Candy, which has come at just the right time for me with the approach of my own publication date next summer. First stop - finish my edits. Second stop - pull my finger out and come up with a plan! Third stop - make things happen! Great tips! 'Being amazing' sounds like a pretty integral one.